What Is an SMS Implementation Plan? As a safety manager, the implementation plan is your road-map to success, but finding guidance on how to create one is difficult at best. The FAA doesn't provide an implementation plan for the latest Part 5 regulations, but there is an implementation plan suggested by ICAO 9859. ICAO recommends a 5-year plan with 4 phases of implementation, but this plan may not work well for small organizations, or those with many elements already in place. The 4 phase plan can be pretty overwhelming at first. Remind yourself that a complete SMS implementation may take years; you're planning a long-term project. Your implementation plan is the document that guides your organization through this process. An aviation SMS gap analysis should not be overlooked. Make sure you choose an appropriate model to evaluate your organization against established SMS standards. 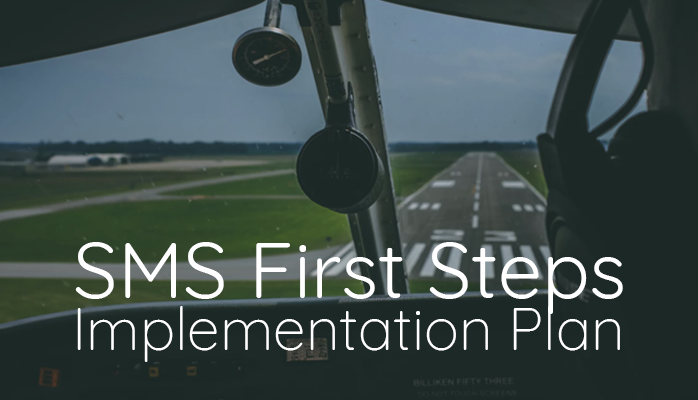 Once you've completed your gap analysis for your aviation safety management system (SMS), your next step as safety manager is to create the implementation plan. Your implementation plan will be unique to your organization, but every plan should clearly outline the steps required to put your SMS program into practice. It may not have been obvious at the time, but this is what your gap analysis was leading up to. Your initial gap analysis revealed any SMS elements already in place as well as which are currently lacking. Then, by listing shortcomings from your gap analysis, you have quickly created a rough outline of your implementation plan. So what's left to do? Now you're going to use that rough outline to create a comprehensive plan to put in place a fully-functional SMS program. If that sounds like a lot of work, keep reading. How Do I Create an Implementation Plan? Much like a big research paper or a major renovation, it can help to break down SMS implementation plans into small, manageable pieces. Rather than trying to tackle the whole plan at once, focus on creating a plan for each shortcoming from your gap analysis. Be sure to check in with department heads or subject matter experts to see if they notice any flaws in your plan. Finding these pitfalls before presenting or implementing your plan will save you time and frustration along the way. As you proceed, you’ll want to organize all this information in a way that makes it useful. This can be as simple as a spreadsheet in MS Excel listing each requirement with a column for the plan to accomplish it. While spreadsheets suffer from many limitations to manage SMS data, most aviation service providers don't have an SMS database at this point in their SMS implementation. For example, an SMS database does a better job at tracking SMS activities than spreadsheets. Spreadsheets are more difficult to work with in a team setting and don't send team notifications when schedules are slipping or SMS implementation tasks are not managed properly or on time. Here are two free implementation plan templates if you'd like to work in Excel spreadsheets, or you are waiting to acquire an SMS database to manage SMS documentation requirements. Another method would be to create your plan in MS Word or Google Docs. While not tailored for aviation SMS, there are quite a few templates available online for inspiration. They may be more daunting or harder to translate to aviation, but they are in a format that your management may recognize and relate to. If you have a larger operation, or a lot of tasks to accomplish, you might find yourself underwhelmed by spreadsheet solutions. In this case, you might require project management software or a more advanced SMS database solution designed to satisfy ALL aviation SMS requirements, and not just limited to managing your SMS implementation plan. Training and qualifications management system. Most aviation service providers are looking to cut back on the number of systems that they have to manage in their operations. Adding more point solutions will simply confound your predicament. There are some low-cost, commercially available SMS database solutions that can address all SMS documentation requirements. Squiring your SMS database reduces risk and offers assurance to the accountable executive that your organization can later demonstrate continuous improvement of the SMS. While your implementation plan is an important document, remember it is also a living one. Your implementation could take years, so be prepared to review and change the plan as your SMS matures. Include in your plan a process to review to monitor requirements and make adjustments as necessary. Remember, the only constant in life is change. Why Do I Need an Implementation Plan? When you’re finished, your plan will demonstrate where you are now, where you aim to go, and what steps need to be taken to achieve that goal. Not only does the plan provide a road-map to success for you and your organization, but it makes your progress measurable. At this point in your SMS journey, you should have already secured commitment from top-leadership. If you haven’t, your implementation plan is a great tool to help management understand the requirements and your vision to implement their SMS. If you already have top management support, then you have a great tool to help keep them on board and updated of your progress. When you create a solid SMS implementation plan, you’re speaking management’s language. Your plan provides them with beginning and ending points as well as the steps you’ll take to make it happen. If there’s one thing I’ve learned in dealing with management, and people in general, making it easy for them to say yes vastly increases the chance they'll get on board. Hopefully this helps to answer some questions about your SMS implementation plan. If it has, or if there's more you want to know, leave me a comment below! Also, let me know what other questions you have so that we can explore them together! Published October 2018. Last updated January 2019.